For the elderly. Grew from Ladies Benevolent Society, founded, 1845. First home, 1879, stood four blocks east. 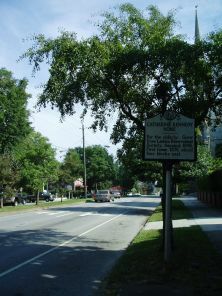 The Ladies Benevolent Society of Wilmington was organized in 1845 for the purpose of general charity work. The organization was chartered by the state legislature in 1852. In that year P. K. Dickerson gave the Society ten shares of railroad stock. Subsequently, in 1879, a building on 7th Street (between Chestnut and Mulberry) was purchased. The facility was used as a home for aged women, and became known as “The Old Ladies Rest.” In 1894 efforts were begun to secure a larger facility, the old one having become dilapidated. In 1895 the group purchased a house at the corner of Ninth and Princess Streets—the former home of shipping merchant Alexander Sprunt. The new home was named for Catherine Kennedy—first president of the Ladies Benevolent Society—and operated as a non-profit and non-sectarian facility. The Sprunt family helped in furnishing some of the rooms. By 1942, the home, run by a matron under the direction of a self-perpetuating board of directors, had twenty-eight residents. In 1950, the facility moved to a new location on Third Street (at the corner of Orange). 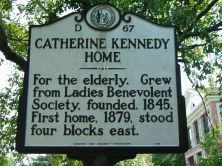 The Catherine Kennedy Home operated as a non-profit independent living retirement community for more than 100 years. It was among the oldest homes for the aged in America when it closed its doors permanently in July 2000. Increased competition from home health agencies and assisted living facilities, and the increased cost of maintaining an historic structure, were factors in the board’s decision to close the home. The Catherine Kennedy Home Foundation was created following the home’s demise. In 2003 the foundation presented $60,000 in grants to charitable organizations that promote the welfare of the elderly in southeastern North Carolina. The grants were a part of the Foundation’s mission in managing and administrating the charitable assets received from the home's sale. Its work continues today.